The Blue-crowned Conure (Aratinga acuticaudata) is endemic to South America, where it has a large range. It is found in the central areas of South America, namely eastern Colombia, northern Venezuela, South-western Mato Grosso in Brazil, lowland Eastern Bolivia, Paraguay, Uruguay, Buenos Aires and La Pampa in Argentina. They inhabit the more arid regions of tropical zones, such as thickets, grasslands, savannahs, and forest edges. 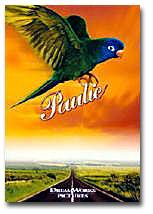 This conure has gained fame after being featured in "Paulie" - the story of a very talented talking parrot and his adventures while trying to find Marie - the little girl who raised him. Their estimated lifespan, provided proper care is given, is 20 or more years. Danish: Blåkindet Aratinga ... German: Spitzschwanzsittich ... Finnish: Sinipääaratti ... French: Conure à front bleu, Conure à tête bleue, Perriche à tête bleue, Perruche à tête bleue ... Guarani: Marakana, Ñendai ... Italian: Conuro testablu, Parrocchetto capoazzurro ... Japanese: togariinko, togarioinko ... Norwegian: Blåhodeparakitt, Blåhodet kilehaleparakitt ... Polish: konura niebieskoczelna ... Portuguese: Aratinga-de-testa-azul, jandaia-de- cabeça-azul, maracanã, periquitão, periquito-de-bico-rosa, Periquito-de-cabeça-azul, periquito-de-pé-rosa ... Russian: ????????? ???????? ... Slovak: klinochvost modrocelý ... Spanish: Aratinga Cabeciazul, Calacante común, Calancate, Calancate Común, Loro Cabeza Azul, Maracaná cabeza azulada, Perico Frentiazul, Periquito de Cabeza Azul ... Swedish: Blåkronad parakit ... Chinese: ???? Blue-crowned Conures are quite large, generally growing to about 14.5 inches (~37 cm) in length (from top of the head to tip of tail). Their wingspans are generally around seven and a half inches; and they weigh between 3 - 5.8 oz (84 - 165 grams). Although the birds are primarily green, the crowns of their heads are blue. There are two shades of blue on a Blue-crowned Conure's head: a bright, darker blue and light, sky blue-tinged shade. Their green bodies offer a variety of green shades. They have the white eyepatch typical of Conures and their bills are usually bi-colored. The upper beak is horn-colored and the lower beak is usually black. The Conures with bi-colored bills are often called Sharp-Tailed Conures. 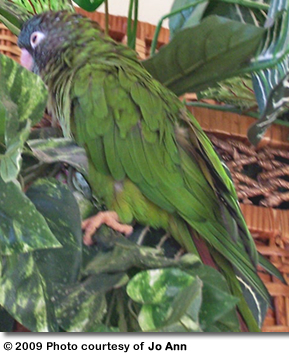 The underside of a Blue-crowned Conure's tail is a variegated shade of red, ranging from pink-red to dark rust. This species is sexually dimorphic - although gender differences may only be noted by individuals experienced with this breed, and even then mistakes can occur. 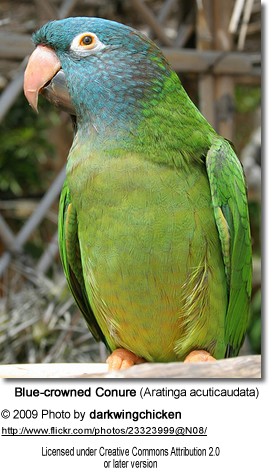 Male Blue-crowned Conures have larger white eyepatches than females, and the feathers of their ceres tend to be longer. When in doubt, DNA or surgical sexing is recommended. Range: East Bolivia, Paraguay and southwestern and southern Brazil to western Uruguay (where it is possibly extinct) as well as northern Argentina. ID: Adults have a dull blue face. The chest on some birds is washed blue. The tail is green on the upperside and brownish-red below tipped with yellow-olive. The upper bill is horn-colored tipped with grey. The lower bill is greyish brown. The eye rings are bare and whitish in color. The irises (eyes) are orangey. Juveniles have brown eyes. Range: Found in upland eastern Bolivia. ID: Adults have a blue face. The under plumage is suffused dull blue. Juveniles have brown eyes. ID: Adults look like the Neumanni subspecies described above, but the face is a paler blue. The under plumage lacks the blue suffusion. The upper and lower bills are horn-colored. Juveniles have brown eyes. Range: Northeastern Colombia and northern Venezuela. ID: Adults like the Neumanni subspecies described above, but there is less brownish-red on the under tail and they are smaller in size. ID: Resembles the nominate race, but the under plumage is washed with blue and they are smaller in size. The Blue-crowned Conure's calls when alarmed are: whreee and wrra. Calls made in flight or when perching are loud and repetitious - whii, whhee and wrri. In their native habitat, they breed in tree cavities. Captive breeders usually readily accept nesting boxes and are known to be prolific breeders - up to three clutches may be produced in a year. However, two clutches a season is the norm. The hen lays 3 - 5 eggs, which she incubates for about 24 days. The young wean when they are about 10 - 12 weeks old. The Blue-crowned Conures are known for their intelligence, sweet dispositions and playfulness. They do not make good apartment birds, as they are destructive and are known to be very noisy. 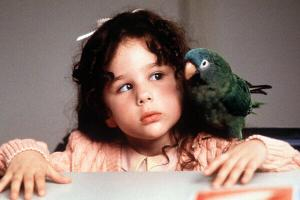 Both sexes are known to learn tricks and talk; however, their talking ability is nothing like it was implied in the movie. The Blue-crowned Conures are loving and devoted companions; but are can be bossy and boisterous. They have a very high energy level and toys and a playpen and plenty of out-of-cage activity must be provided to meet their requirements. 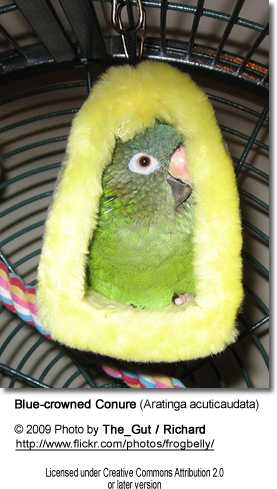 They are generally not as rowdy or nippy as some other conure species can be. 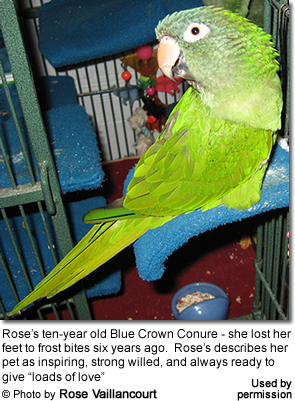 Blue-crowned Conures reach maturity at 2 - 3 years. The incubation time is 24 days and chicks wean at 11-12 weeks. 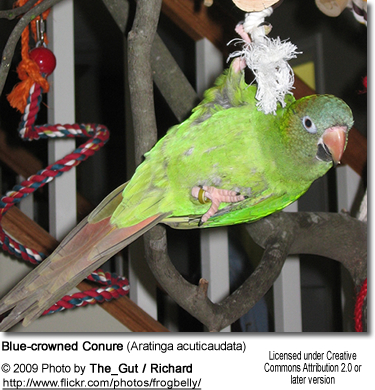 These conures are generally fairly easy to breed. 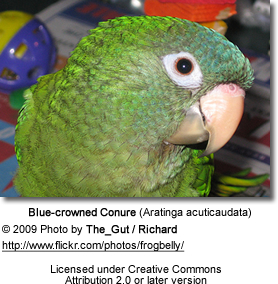 Bolivian Blue-crowned Conures: Please scroll up for photos and information. Blue Crown Conures aka Blue Crowned Conures: Please scroll up for photos and information. Orinoco Blue-crowned Conures: Please scroll down for additional information. Margarita Conures: Please scroll up for photos and information. 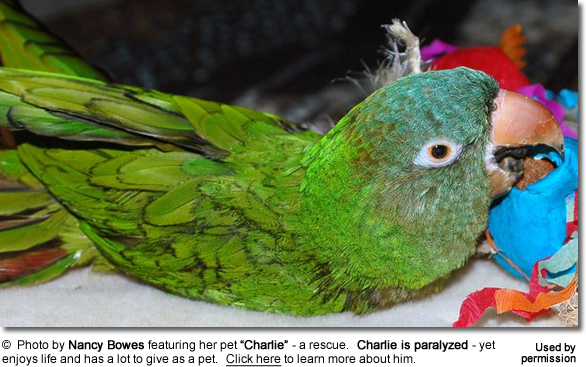 Venezuelan Blue-crowned Conures: Please scroll up for photos and information.